Sorry, but is still the same? Kinda ironic, but "SCANF" in name was never related to scans. Well, Skype seems to be the most popular one so far. Add me (nekit1000) and I will add you to the group. Good idea actually. I wonder what software would be most convenient for those who would like to join. You could do a poll with options like Skype, Discord (pretty new, but looks promising), Telegram and so on. Well, it would be good to have translations to other languages. I'm not sure it can be done right now, there are some problems we need to solve first, but thank you anyway. The main issue we currently have is server disk space. I wonder how many people speak Spanish at SCANF. I think that there were official Spanish translations of some issues. A huge Linux fan here. I like that it can run on huge amont of devices, and, as Noodles said, allows tinkering to customize it for yourself. I use it as main OS and all SCANF programming by me has been done on Linux so far. What is your phone and what browser do you use? Have you tried flushing the cache? What is your browser? Can you attach a screenshoot? Have you tried to redownload it? Works for me. What do you open it with? Usually spell corrector is a feature of your browser. Do you have it configured properly? Well, let me shine some light on this. During few last days the site was under DoS attack by some user (actually he left a few "threatening" comments and showed accidentally who he really is) for unknown reasons. It surely wasn't enough to kill the server, but caused some noticable slowdown. We decided to try CloudFlare for protection, as Sonic Retro does. Unfortunately, its activation cause en.sonicscanf.org to be unavailable for some time, as I forgot to about "en." subdomain prefix, while everything else worked. But the bright side is that it also serves as CDN and should make SCANF load faster now, as static resources (images, css, scripts, etc) are being cached on their side. I can explain how to do it, but you need a hacked Xbox 360. If you've been redirected here trying to view the comics, let me explain. Unfortunately, we can't afford more traffic for now. In an effort to somehow lower the usage until the end of the month, we've decided to allow only registered users to access the comics. I understand that this may seem annoying and I'm sorry, but please, understand, that this is done in order to keep the site running. If you like it here, it shouldn't be too hard to register and leave a few posts to show your appreciation. edit by Lunar Chaos: I think this thread has lived its course, there's nothing left to discuss, everything's already been said. If you are new to the forums and don't know where to start, we have plenty of other boards, Sonic and not-Sonic related. You can also introduce yourself in the introduction topic, if you want. I remember what troubles it brought when we were working on Sonic Rush translation. Though for the most part it was because you didn't use color picker to choose the right "white", but lack of transparency support is a huge minus. I've tried to make this topic a litle more general, so all past and upcoming issues can be discussed here. Unfortunately, it's not possible to make another post the first one, so Shadow's post had to be edited to include topic's description. I hope he is not against of this. The same could possibly be made with Sonic Universe/Sonic X/etc. It's possible in future, but first we're going to implement the "Latest Updates" block, which will serve for this partially. Also, I've merged the thread with another one created for suggestions. Otherwise, unfortunately, we'll have to move your posts in trash. The idea of merging the forums made me interested, but I doubt that will work. It would be a mess if we put all the sections from Russian and English boards onto one. We've thought about "transfering" the activity, but as Lunar has already explained, only a few can speak both languages good enough to participate. Actually Russian community had already existed before comics section was opened. It was more in a effort to let our fellow fans know that Sonic is not just about the games and there is another beautiful Sonic world. However, a lot of foreign people started to find us for comics and gallery. English version was an another experiment, and as you see, mostly failed one. I see Lunar's point why. Still, it would be nice if we could unite the comic-reading userbase we already have as a community. It's possible to do so, but the idea was not to have too much areas with a few topics. Though I'll create some here. Unfortunately, we won't be able to accept donations due to different payment systems used in Russia, and this could put us in trouble anyway. But, Viceversa96, you can help us to make it a better place here by participating in the community. I hope the rumor will be proven false, though, remembering past, it's a very desperate hope. 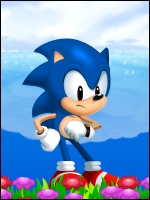 Really, SEGA, why recolor Sonic? Aren't other characters enough? I'm getting tired of playing only Sonic(s) or forms of him. Sonic Adventure was a nice example of various gameplay, except, maybe, fishing. Or even Sonic 3 & Knuckles - having Tails/Knuckles greatly extended the game. Added Tails in Sonic CD port is a good sign. As for the name, if it's true, Sonic Dimensions can be just a working title, like Sonic Anniversary, later renamed to Sonic Generations.